The holiday season is upon us and thus far it has proven to be a very busy one indeed for Pockets! Our Rays have been hard at work for several months already on the various projects we have had this season, making bookmarks and totes for the book festival, working on our Recycled Art Project and creating some beautiful decorations for the annual Festival of Trees! The Festival of Trees is a local fundraiser benefiting Hilton Head Preparatory School. Our Rays have participated for the last several years, each year creating a differently themed “Sunshine Tree”. The beautiful trees are then put on display at a local resort for several weeks and auctioned off to raise money for the school. What a festive and fabulous fundraiser! 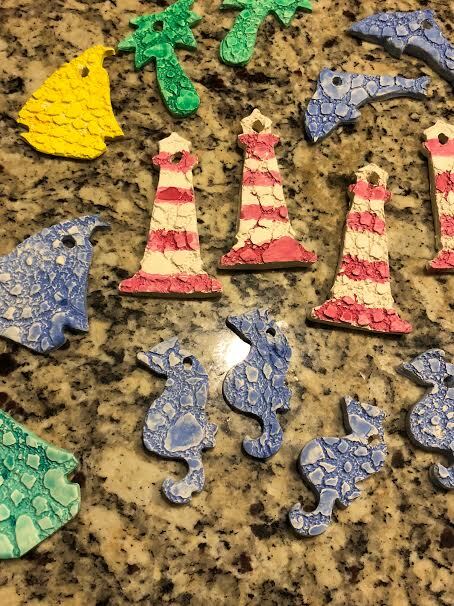 Besides supporting our local schools, this fundraiser provides the Rays with a fun and creative crafting opportunity and also gives them a chance to be active participants in a local event and connect with their community, all part of the PFS mission! This years tree was beach themed and under the guidance of our friends Danielle and Crystal, the Rays made beautiful air dry clay ornaments to adorn it. Everyone had a lot of fun creating this years tree and its beauty certainly speaks for itself!